If you had a dollar for all the grammar mistakes you’ve made (or have yet to make) in your life, you’d be rich by now. Unfortunately, you don’t get paid for making grammar mistakes, and making too many errors could cost you time and money at work or in school. 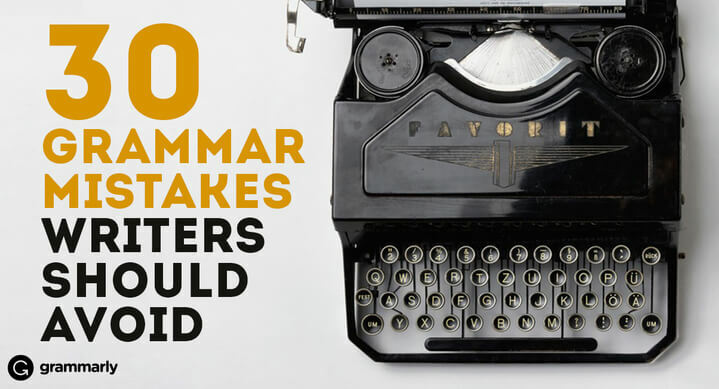 To save you time and money, as well as embarrassment, Grammarly collaborated with Daily Writing Tips and Write to Done to compile a list of 30 grammar tips for writers. Use these handy tips to improve your writing so your work will be clearer, accurate, and more professional. The boy ran really fast to catch the runaway ball. The boy sprinted to catch the runaway ball. Adverbs—those words that often end in -ly—modify verbs. They’re okay once in a while, but in excess they’re an indicator of weak verb choices. In our example, the adverb “really fast” modifies the verb “ran.” But does “really fast” paint a more vivid word-picture for the reader? Use a juicier verb like “sprinted” instead. The caravan came over the top of the hill. The caravan crested the hill. Prepositions are those words that often come before nouns and pronouns to show direction, location, or time. In the first sentence we have two prepositional phrases—“over the top” and “of the hill.” Excessive prepositional phrases render your writing wordy. Whenever possible, simplify. Listening to loud music slowly gives me a headache. When I listen to loud music, I slowly develop a headache. A squinting modifier is a misplaced modifier that, because of its location in a sentence, could modify either the phrase that precedes it or the one that follows it. (In the example sentence, is the subject listening to music slowly or slowly getting a headache?) To correct a squinting modifier, move its position in the sentence to make it clear to the reader which word you intend to modify. He was laying on the couch. If you plan to place or put an object somewhere, such as a plate on a table, you should use “lay.” If you intend to stretch out on a bed for a nap, you should use “lie.” The verb “lie” is an intransitive verb, which means it does not need an object. The transitive verb “lay” requires an object. It may take some getting used to this “lay” or “lie” business; after all, misuse of these verbs is common. But if you remember to lay down your fork before you’re full, then you won’t have to lie down later from overeating. John had a card for Helga, but couldn’t deliver it because he was in her way. John had a card for Helga, but couldn’t deliver it because Tim was in Helga’s way. Lila enjoyed the bouquet of tulips John gave her on prom night however she prefers roses. Lila enjoyed the bouquet of tulips John gave her on prom night; however, she prefers roses. Run-on sentences, also known as fused sentences, occur when two complete sentences are squashed together without using a coordinating conjunction or proper punctuation, such as a period or a semicolon. Run-on sentences can be short or long. A long sentence isn’t necessarily a run-on sentence. Lily enjoyed the bouquet of tulips John gave her on prom night. Both sentences are complete ideas by themselves; therefore, use a semicolon or a period to indicate that they are separate independent clauses. It has come to our attention that your tax returns are overdue and we urge you to file them at your earliest convenience. Your tax returns are overdue. Please file them now. If you have something to say to readers, spit it out (figuratively, not literally). Inflating sentences with unnecessary words or pointless filler only muddles what you mean to say. Wordy sentences also frustrate readers, so get to the point. Streamline your sentences by using strong verbs and nouns instead of trite adjectives and adverbs. William Shakespeare once wrote that brevity is the soul of wit. Follow the Bard’s lead by never using ten sentences when two will suffice. Don’t overuse words such as “that,” “just,” and “very.” Proofread your work to keep your prose tightened and toned! Sam could of received an A on his essay, but he made too many grammatical mistakes. Sam could have received an A on his essay, but he made too many grammatical mistakes. Jack made a water pail with his own hands for Jill. Jack made a water pail for Jill. Tautologies express the same thing twice with different words. In our example, the word “made” implies that Jack used his own two hands to create the pail. The prepositional phrase “with his own hands” creates a redundancy. Once you know what they are, it’s fun to discover tautologies: dilapidated ruins, close proximity, added bonus, large crowd . . . The list goes on and on! Get 10 more important tips at Daily Writing Tips and another 10 at Write to Done!